Louis Schweitzer is Chairman of the board of Renault since May 2005. of AstraZeneca and AB Volvo. He is honorary Chairman of Renault. 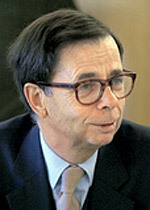 Formerly he was Chairman and Chief Executive Officer of Renault from May 1992 to April 2005. During his tenure, he was also President of the Management board of Renault Nissan BV from 2002 to 2005. Mr. Schweitzer has opened the company to private shareholders in 1994 and led the privatization of Renault in 1996. On March 27, 1999, Renault and Nissan agreed to join forces to achieve profitable growth for both companies forming a new entity ranking fourth in the world automotive industry. Since then, Renault has taken a majority stake in Dacia and Samsung in 2000 and became first stakeholder of AB Volvo in 2001, which is now running Renault’s industrial vehicles activity. Mr. Schweitzer holds a Master’s degree in Law and studied at the “Institut d’Etudes Politiques de Paris”. He carried on as a student at the “Ecole Nationale d’Administration” from which he graduated in 1970 as “Inspecteur des finances”. Mr. Schweitzer has been appointed in March 2005 for a five years mandate Chairman, from 2005 to 2010 President of the French high authority to fight discrimination and promote equality. Mr Schweitzer is was also Chairman of the Supervisory Board of the French newspaper Le Monde from 2009 to 2011. He is Chairman of AstraZeneca since January 2005 and of AB Volvo since January 2010 and serves on the board of BNP-Paribas, L’Oréal, and VEOLIA Environnement and AB Volvo, as well as on the board of a number of not-for-profit institutions. He is President of France Initiative, a not for profit organization whose aim is to finance the creation and development of small enterprises.